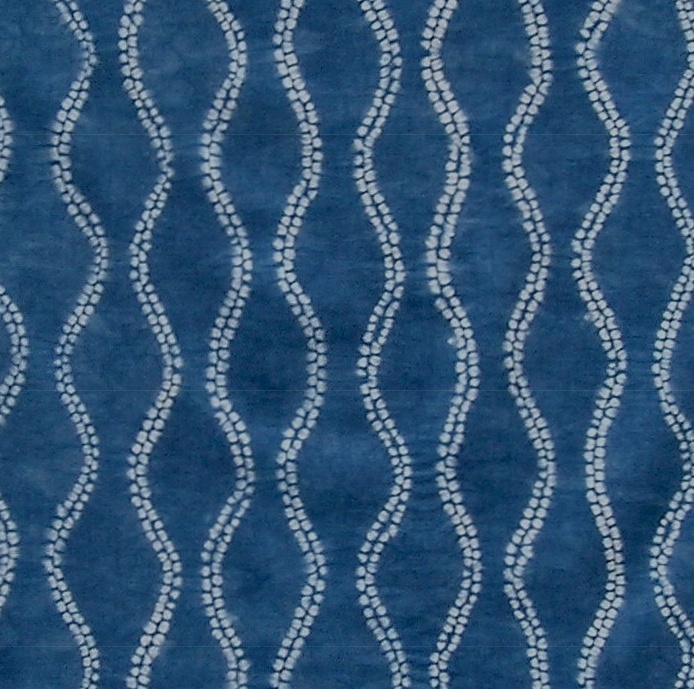 Tatewaku in shibori and indigo on linen. More often than not, I seem to return to traditional patterns. There’s much to be learned there in the seeming simplicity. There is also another aspect, the terminology – what it means, the stories behind the words. The kanji isn’t in the text, so on a search using「たてわく] found「立枠」 in the context of kimono patterning ( illustrated). Looking more closely, 「立て」(tate) means “to stand” or “rise” and 「枠」(waku) means “frame, framework, spindle, spool” and “bounding-box” (Jim Breen). Mary Parker, in her book, Sashiko, says that it’s called “rising-steam” and that it dates back to at least to the Heian period. By the Edo (Tokugawa) period it was used as a framework for floral and circular patterns in textile work. のたり　のたり(notari notari)- an expression meaning gently swelling and rolling. はせん・波線 ・hasen is a wavy line. なみがた(namigata) and はけい（hakei）波形 define as a wavy form or rippling shape. えんえん(en en) which refers to the feeling of meandering, winding, and zigzagging…. Finally, I encountered へびのよう「蛇の様」・hebi no you – like a snake. This of course, has no relation to tatewaku, or does it? It was fun to meander through those definitions. This entry was posted on January 15, 2013 at 6:28 pm and is filed under Color, craft, culture, History, Indigo, Language, process, Shibori, Textiles. You can follow any responses to this entry through the RSS 2.0 feed. You can leave a response, or trackback from your own site. It definitely is, since you mentioned it, I looked it up. It’s a different kanji – here it is: 経糸・たていと) (weaving) warp.